The exciting young website Lyreka has steadily built momentum providing a platform for music fans to share and talk about their favorite song lyrics. 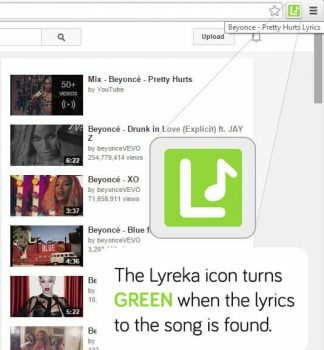 Recently, Lyreka announced they’ve expanded to now include a Google Chrome Extension that allows users to find lyrics for songs while on Pandora, YouTube and Spotify, as well as added a very informative music blog section to their popular site. For many people, a song’s lyrics are just as important as the music they are delivered through. The right lyrics can inspire great emotions, cause reflection, promote or debate social issues and sometime even change the way a person views the world. Formerly exploring song meanings required a combination of a skilled ear, having physical copies of the recordings with lyrics sheets or extensive website surfing. The young website platform Lyreka has changed all that. In the last few months, Lyreka has provided a place where users can share, discuss and dissect lyrics in a way that has been shown to be as exciting as it is innovative. Recently, the company announced they are expanding what they offer with Lyeka to include a new Google Chrome browser extension that allows users to find lyrics on Pandora, YouTube and Spotify while they enjoy themselves online and a new blog section on Lyreka.com covering music and music news. “ We couldn’t be happier about the response to Lyreka ,” commented Omar Robinson, General Manager of Lyreka LLC. It’s wonderful to see how many people are just as passionate about song lyrics as we are and now have a place to share their passion with others. Our latest additions to what we’ve been offering make Lyreka better than ever. According to Lyreka, the new Google Chrome extension is very exciting in how it expands the ways their website can be used and accessed. Whenever a user listens to music on YouTube, Pandora or Spotify, the extension checks to see if lyrics are available. Once they are located a green light lets the user know they can check out the lyrics on Lyreka with a simple click of a button. This makes finding lyrics to new songs or old favorites simple and fun, and promises to bring a whole new level of activity to Lyreka.com. Lyreka’s new blog has also been met with enthusiasm. Exploring the latest in music and music news in an exciting and lighthearted way, the blog has become a hot topic of online conversation. Popular posts include an exclusive list songwriting tips from world class musicians and a discussion of the possibility Will Smith forgot the lyrics to the Fresh Prince of Bel Air theme song. The platform’s users continue to give Lyreka endorsements across the board. Diane P., from New York, recently said, I’ve really loved Lyreka since I first found out about it, since I’m a musician and writer and lyrics absolutely fascinate me. The extension for Chrome has made it even better. Now when I hear something I like on Pandora I can see the lyrics right away. It really helps inspire me. Five stars. Download the Lyreka Google Chrome Extension Now!